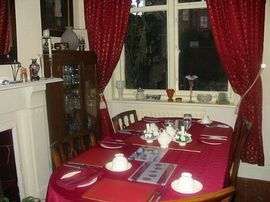 No 40 is an elegant Victorian end terrace house with 2 en-suite guest rooms and no smoking throughout. Situated in the quiet and fashionable Bootham area of York: a 5 minute gentle stroll to the old city walls, a 10 minute stroll from the remarkable Minster and the many attractions in the city centre. Because we offer calm and tranquility, we regret that we are not able to accommodate children. 'Rose' has a superking bed which can be made into 2 full size singles and a double bed settee - so the room can accommodate up to 4 adults. 'Daisy' is a pretty double bedroom overlooking the courtyard garden. 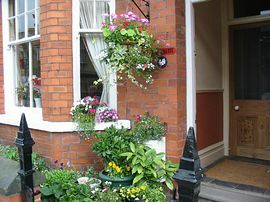 No 40 is fully double glazed with central heating (thermostats in all rooms) and each room has a hospitality tray with tea, hot chocolate and coffee with fresh milk and biscuits as well as Sky TV, a hair dryer, iron and ironing board. Peaceful and tranquil, evoking memories of the past but with the facilities of today. Private off street car parking. Special Diets Provision: Special diets are catered for. Let me know your requirements and I will do my very best to meet them. Drive onto the A1237 and take the A19 from the North into York. At this roundabout you are exactly 2 miles from Queen Anne's Road - turn right at the traffic lights (The Grange Hotel right hand side) and No 40 is the first end Terrace on the left hand side. Directions are sent by e-mail with acknowledgement of deposit. 'Rose': minimum of £35.00 per person per night. 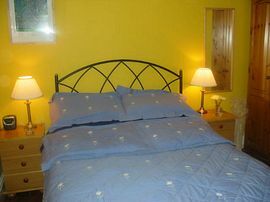 'Daisy': minimum of £30.00 per night. 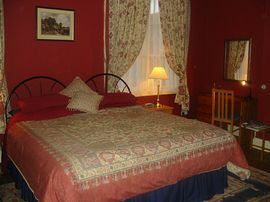 Maximum for both rooms £40.00 per person. Open all year around apart from Christmas and New year.